S.E.O. We’re not even into the subject matter itself, and already it’s throwing acronyms at us as a not-so-friendly reminder that we’re wading into unknown territory. Well, I say “unknown,” but if you do an internet search for “Search Engine Optimization,” you’re going to be overwhelmed by the sheer volume of results. But pop one of those open…any of them…and start reading: “title tags,” “meta tags,” “alt tags,” “URL structure,” “robots.txt,” I mean…seriously…if you don’t have a background in HTML or a deep fascination for reading gobbligook, then most resources on this subject will leave you cold…or put you to sleep. You see, most discussions around SEO tend to fixate on “how to build and rebuild the structure of a website to best be seen by a search engine.” Then they immediately start giving instructions in much the same way that a car repair manual assumes you’re the one with the hood up and a wrench in your hand. But as a business owner that may well not be the case. You’re running the business; someone else is staring at lines and lines of HTML code. And this is a problem because as a website owner you’re going to want the benefits of a fully optimized website; a site that turns up in search results against keywords and phrases you know your potential customers are going to use. And herein lies the big disconnect: Search Engine Optimization techniques talk “code,” which will mean – at best – you’re sitting at the same table as your programming team, not understanding one thing they are talking about. You’re following their lead as if this was a technical discussion. But here’s the kicker, search engines want the same thing that your customers want: good, relevant content. It’s just that a search engine wants it to be presented in a way that it can “see” and “understand”. So how do we empower YOU with the tools you need to LEAD the SEO conversation, so you can make sure your site’s content is good for your human and electronic visitors? Think of a website like a book: there are different subjects and varying levels of content – some more image intensive than others – but ultimately there are lots of them. So now imagine you’ve just wandered into a small library and you’re trying to find a book on a particular subject. Aside from narrowing down your options via the library cataloging, and whatever in-building technology they may have, there’s going to come a point when you’re looking at multiple shelves of books, any one of them has a potential match for your needs. So how would you go about finding out which book is the one you want? For starters you’re going to walk down the aisle skimming through book titles: the titles can often help dial-in what the book is about, right? You’ll discount obvious misses, and then start picking up and handling ones of interest: what does the blurb say on the back cover? Still interesting to you? Let’s pop it open and flick through some pages: are you seeing relevant content? You’ll scan pictures and read section of text until you satisfy yourself that you are – indeed – holding the right book. Because this is exactly what search engines do when someone types in a search phrase: they take that phrase and compare it against databanks of websites they have “visited” and then they list out the names of the sites that the search engine thinks are the best matches. So How Does a Search Engine “read” my Site? The search engines can’t understand your page content per se, what they do is grab all of the words on the page and they try to figure out which ones are most common, thus getting a sense for what the subject matter is. These words can then be compared against what a customer types in as a search: if the two match, then what the customer is searching for must be found on your website, right? And I’m going to bet that from this seemingly random set of words, you already know what the website is about. So if a potential site visitor performed an internet search for “Golf,” the webpage on which these words appear would be a potential match. We get two hits there – on “Golf” and “Ball” – both of which are on the page twice. We’ve got ourselves a good match, so the search engine will doubtlessly show it in the list of results. Wait … a “List of Results?” I’ll be at the Top, Right? Here’s where we start to get into some of the nuances of Search Engines. You’ve used Google, Yahoo, or Bing many times to find something on the internet, and every time you have performed a search there has always been a list of possible matches. Sometimes the returned suggestions can be in the hundreds, or thousands, across multiple pages, and you probably only dig through the first two, right? And which ones get most of your attention? The first half a dozen on the very first page. Which is why all site owners want their websites to turn up at the top of the search results, because other internet users do exactly the same. And this is where YOU get the power, because by now you are probably realizing that the content on your site has to have some relevancy to the phrases your customers are using. If you want to be found on the phrase “The History of Golf,” but the words “history” and “golf” do not appear at all, then you’re not going to be found (on that particular phrase). These search phrases are referred to as “key words.” Identifying which search phrases are most relevant for your product is a fundamental and crucial part of being found on the internet. In other words: understand what your customers are searching for and then ensure those search phrases are in your content somewhere. So Why Not Spam “Keywords” Across my Website? The first inclination is to now come up with a webpage that has “The History of Golf, The History of Golf, The History of Golf, The History of Golf, The History of Golf” everywhere, right? Well…no…because now when a site visitor finds you, your site isn’t legible to the human being we were trying to attract in the first place, so they’ll instantly leave and try to find a more relevant and informative website. Plus, search engines are getting smart at understanding if a word or phrase is being artificially inserted into a page, and they will penalize a website where they think this is happening! The presence of keywords and phrases in your site’s copy is one way search engines understand what your website is about, but they look for several other things to help them determine if your site is more relevant than another site and should therefore be placed higher in the search results. Let’s say that you and a competitor both have the words “Golf” and “Ball” twice on your respective websites, and that a potential customer searches for “Why are Golf Balls White?” Theoretically, either site could be a potential match. There’s no way for a search engine to know which is more relevant than the other, which is why several other things are looked for. I’m going to purposefully stay away from the technical details, and the degree to which you can influence what follows will vary according to your organization, but here are some fundamental concepts you should know or your programming team should be asking you about. Should they not ask you about these points – you can be the one to bring them up, and thus able to be pro-active in optimizing your site for search engine placement. This is your Page Title. Page titles are visible to your site visitors in both their browser window (as shown above), and as part of the search results (see below). You therefore want to ensure that your page names are relevant and human-friendly, but also that they capture one or two of your key words for that page. The above example is a perfect illustration of how to do this. Had they chosen to go with “About igfgolf.org” then they would have failed to include any key words and the page title would not be used to help the search engines understand what it’s about. Page titles should be different from one another and pertinent to the page. If you do not have page titles, search engines will “see” “<untitled>” and that’s never a good thing. Always give your pages titles, and always make sure they include keywords. This is called a “Domain Name.” It’s basically your address on the internet and what you put on business cards and the like. Often you’re part of a larger organization and your domain name is fixed, but if you are launching a new site and you have the opportunity to purchase a domain name (or set up a sub-domain) then having a keyword or two in here can help search engines identify what your site is about. 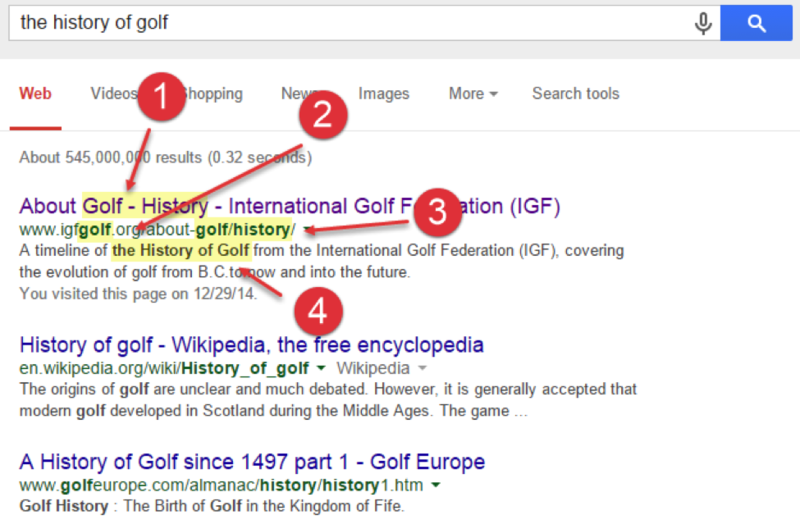 See how – in the image below – Google has made the word “golf” bold in “igfgolf.com?” That’s because Google recognizes that keyword in the domain name and is giving it a boost because of that. igf.com would not contain a keyword, so it would be a ‘weaker’ name. golf.igf.com (called a sub-domain or “vanity URL”) would contain a keyword, so this would be a good option if you could not dictate the primary domain. If you can influence the domain name or have your technical department set up a sub-domain/vanity URL, consider including a keyword. This may be getting into the “technical-zone” here but bear with me. You see websites really are not the magical mystery we often think of them as. They’re effectively a bunch of files (think: word documents, images, etc) all organized neatly into relevant folders (images, videos, scripts) in much the same way that you have your “my documents” or a project folder organized. In the same way you navigate through your computer to find assets, revealing a path such as “C:\Users\natalya\Documents\My Meetings,” so too websites have exactly the same structure…it just gets appended onto the end of your domain name (but it’s how the browser knows where to find things). And clearly there’s no mention of “golf,” “history,” or just about anything else in this example. The domain name contains no keywords, the sub-domain/vanity url does not either, the subsequent folder name is a bland “content,” and then we get a series of sub-folders and a final page name that are about as cryptic as you can get: a series a numbers! What a lost opportunity is it any wonder that this site in question was down around page ten of the search results? One last point: #4 in the image above is copy taken from the destination webpage; this is an illustration of how Google (and other search engines) “read” your pages in order to gather up all of the words on them to determine what the page is about. The visitor has typed in a search phrase on “the history of golf,” and Google found that the page in question had “the history of golf” as copy on one of its pages. This is a great illustration of how customer-centric copy can be informative and useful, and yet still “speak to” the search engines as well. If other websites with similar content are linking TO your website, then your website – in the mind of the search engines – must be more important. So if you had 20 Golf blogging sites, a Golf Ball store, and a couple of Golfing forums all linking back to your site, then a search engine would think “wow, all of these golf-centric websites are linking back to this site – which is also about golf – if someone searches for “Golf” I’ll be sure to rank them higher. These links TO your site are known as “backlinks,” and they are an important part of “earning points” with the search engines.